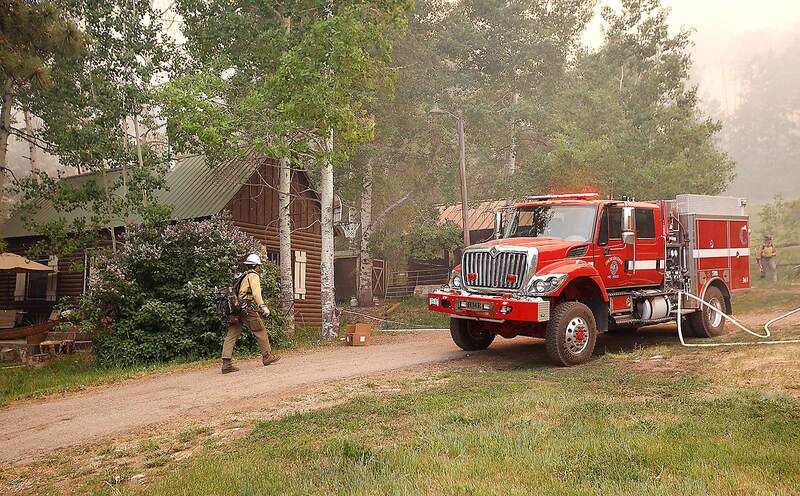 Firefighters patrol a house west of U.S. Highway 550 south of Needles this summer looking for spot fires as the 416 Fire approached a home. More people than ever want to live on the wild edges of Western cities, despite the risk wildfires pose to their homes. A recent study by researchers at the University of Nevada-Las Vegas found that wildfires drive down real estate prices only in the immediate aftermath of a disaster. Home prices in burned areas typically rebound to prefire levels within one to two years. The finding illuminates a troubling trend: Some of the West’s most fire-prone areas – densely forested, scenic, mountain landscapes that are conveniently close to cities – are also some of its most desirable. When more people move into these areas, the cost of fighting fires rises because there is more to defend – more lives and property at stake. On top of that, because people unintentionally spark many wildfires, the overall risk increases when the woods become more populated, as does the potential destruction these fires can cause in terms of property damage and loss of life. McCoy and his team analyzed real estate data from nearly 360,000 properties across eight Colorado Front Range counties, which experienced 18 severe wildfires between 2000 and 2012. They compared the prices of similar houses located in high- and low-risk burn zones before and after wildfires. And they considered the relative risk of homes within those zones, their proximity to recent wildfires and residents’ views of the burns and their aftermath. The researchers found that the value of homes within sight of burn scars did dip after a fire and were slower to rebound. But even there, homebuyers’ awareness of fire risk didn’t impact their willingness to invest in those properties. Overall, housing values in the high-risk zones dropped in the year following a wildfire, but rebounded to pre-fire prices in one to two years. This article was published on hcn.org on Oct. 4.